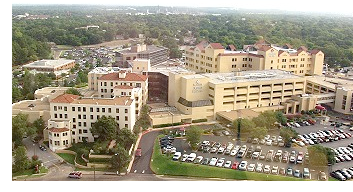 ​​​​ TYLER – CHRISTUS Mother Frances Hospital, located on located on 800 E. Dawson St., is undergoing a major expansion and modernization project. A new bed tower will add two new trauma rooms, 48 ICU beds, an emergency room with 54 treatment beds, and two helipads. The project plans also include replacing the existing garage with a new 297,000-sf parking garage. The parking structure will have one story below ground and four stories above ground, with a 125-foot-long sky bridge connecting the garage to the tower. 2016 CHRISTUS Mother Frances Hospital Named to list of "100 Great Community Hospitals" in the nation. ​​RELATED: New medical systems finds its pulse​​.